Abbie and Ichabod team up with Jenny to track down the "Tooth Fairy," a monster that has terrorised a local child, and the encounter was witnessed by her sister. The trio is informed about the case by Joe, who works as EMT. Young Jessica falls into a coma after being attacked by the tooth fairy and no one but our heroes believes Jessica's sister Saffron, as the demon is only visible to children. When Saffron draws what she saw, Crane remembers about a sickness that effected many children, including Betsy Ross' niece. The children would fall sick after losing their teeth and would never wake up. Betsy called in Paul Revere, who used his job posing as a dentist to ward off the Tooth Fairy by giving children silver coins after losing their teeth. The Tooth Fairy is actually an Ibizu, an Assyrian demon that eats children's souls. The process takes 48 hours in total to complete so the clock is ticking for our heroes. Ichabod and Jenny head to the local elementary school to find which children are about to lose their teeth. One of the children, Gregory, is very quiet as Ichabod gives a presentation on all the historical inaccuracies they have been taught. Gregory not only has a loose tooth, he has been stalked at night by the Ibizu, but his mother hasn't believed him since she can't see the monster. Jenny gives Gregory a silver coin to protect himself, sensing that something was off with him. 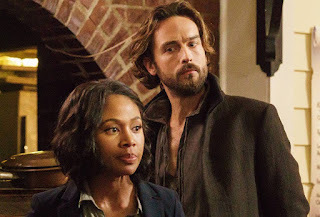 They decide that Ichabod and Joe will keep an eye on another little girl in the class that's about to lose a tooth, while Jenny and Abbie will watch out for Gregory. Gregory's so busy being ignored by his babysitter that it's up to Jenny and Abbie to come running when Gregory screams after losing his tooth and using the silver coin to ward off the Ibizu. Jenny gets knocked out while using the hose to make the monster visible. Abbie stabs it but then gets thrown against the porch and knocked out too. The Ibizu runs off and Abbie is put in the hospital. Ichabod tells a sleeping Abbie to heal while Jenny assures Saffron that her sister will make it. Pandora pays a visit to Abbie, waking her from her sleep. Pandora wants to give her backstory: her father beat her till she couldn't speak and then sold her as a slave. She then gained her ability to speak back and promptly convinced her owner to feed her father to a lion. She also talks about how Abbie treats life like a duty. Ichabod and Jenny have figured out that they need to put a gun together that will be loaded up with silver nitrate because it will make the Tooth Fairy visible. The monster goes after Saffron after she follows an idea planted in her head by Saffron to use a tooth and fight the monster. Ichabod and Jenny save Saffron and chase the monster into the woods and are eventually able to illuminate it so Jenny can stab it through the heart with a fireplace poker. It turns to dust. Jessica wakes from her coma and Crane visits the dentist for the first time in hundreds of years. He gets high on painkillers and dreams of Betsy. But upon waking he looks up the word Pandora used to describe him and Abbie and finds that it's Sumerian for "destroyers" and the pair realise that Pandora knows something bigger about them than they themselves know.